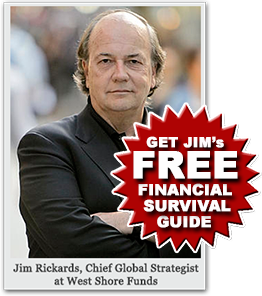 Don’t Miss This Exclusive Jim Rickards Interview on Financial Warfare, China, Russia, and More! If you are an American or own any assets priced in U.S. dollars, then you absolutely MUST know what’s revealed inside Jim Rickards’ never-before-published book The Big Drop: How to Grow Your Wealth During the Coming Collapse. Coming up you’ll hear the first of an exclusive two part interview with renowned economist and financial commentator Jim Rickards. Jim shares his incredible insider perspective on the state of the global monetary system, the state of our economy, and what it’s all likely going to mean for gold and silver in the days ahead. Don’t miss the first part of my two-part interview with Jim Rickards coming up in just a moment after this week’s market update. Well, the bulls and bears in the gold market continue to do battle around the $1,200 level. Bears gained the upper hand early in the week, but the bulls came back strong on Wednesday, pushing prices back above $1,200 an ounce. As of this recording, gold trades at $1,204.50, good for a weekly gain of 0.4%. Silver, meanwhile, is flirting with the $17 level for the second consecutive week. The silver market finished at $16.99 last Friday, then proceeded to sell off early this week. Silver prices currently come in at $16.81, down 1.1% on the week. Turning to platinum and palladium, both metals exhibited weakness throughout most of March but are on the rebound this week. Platinum is up 1.5% to trade at $1,158 an ounce, while palladium shows a gain of just less than 1% to trade at $748. All US markets are closed today, Good Friday, but Money Metals Exchange is open for business and you can reach us by phone at 1-800-800-1865 and you can of course order online at any time, day or night, at MoneyMetals.com. As the metals markets look for a catalyst to take them out of recent trading ranges, inflation indicators are starting to turn back up – albeit slowly. On Monday, the Core PCE Price Index came in 0.1% higher for a year-over-year reading of 1.4%. That’s still below the Fed’s 2% target, but housing, medical, and other costs are running well above 2%. The big question is whether strength in the U.S. dollar versus foreign currencies will persist. The U.S. Dollar Index has seen some dramatic swings over the past few weeks. The dollar had threatened to break above 100 on the Index before getting sold down. This week the Dollar Index is little changed at 97.7 as the Obama administration’s controversial plan to lift sanctions on Iran takes center stage. Geopolitical turmoil often drives capital into the perceived safety of the dollar. But that trade has gotten extremely crowded since the start of the year. Some investors seem to be confusing liquidity with value. Dollars are easy to get in and out of almost anywhere in the world, but that liquidity will also be an attribute of the dollar when it depreciates from an overvalued position. Gold is also highly liquid – it possesses universally recognized value and can be bought and sold virtually anywhere in the world. When the dollar loses value, it will be reflected in gold price gains over time – meaning years, not necessarily day to day or week to week. In general, a declining dollar versus other currencies means higher prices for imported consumer products and raw materials. Which leads us to another big question concerning inflation: whether oil prices have bottomed. Falling oil prices have helped depress inflation gauges. But a few months of sustained gains in oil and other industrial commodities could translate into higher consumer costs across the board. Consumers will feel higher costs of living before they show up in government statistics. Of course, one of the biggest costs of living in the United States is taxes. With the April 15th tax filing deadline approaching, now’s the time to make sure you’re claiming every possible tax break to which you are legally entitled. If you didn’t max out your IRA contributions for 2014, the good news is that you can still do so through the April 15th filing deadline, or later if you request an extension. Depending on your income and the type of IRA you select, you may be eligible for a tax deduction on your contribution. For 2014, you can put up to $5,500 in an IRA – $6,500 if you are over age 50. Those same limits apply to IRA contributions for tax year 2015. If you don’t yet have a precious metals IRA, we invite you to consider the advantages of diversifying your retirement accounts into the solidity of bullion. You can hold certain types of gold, silver, platinum, and palladium bullion products within an IRA. The ins and outs of opening a precious metals IRA are explained in the IRA section of our MoneyMetals.com website. There, you can download our IRA brochure and watch our 3-minute introduction video for a quick overview. And now, without further delay, let’s get right to part one of our exclusive two part interview with Jim Rickards, who has lots to say on the state of the economy, the future of the US dollar and why it’s more important than ever to own gold as protection against what’s to come. Mike Gleason: It is my great privilege now to be joined by Jim Rickards. Mr. Rickards is Chief Global Strategist at the West Shore Funds, Editor of Strategic Intelligence, a monthly newsletter, and Director of the James Rickards Project, an inquiry into the complex dynamics of geopolitics and global capital. He is the author of two bestselling books, most recently, the New York Times best seller, The Death of Money and before that, Currency Wars. He is a portfolio manager, lawyer, and renowned economist regularly appearing on CNBC, the BBC, Bloomberg, Fox News, and CNN, just to name a few. Jim, it's a real honor to have you on the Money Metals Podcast. We really appreciate you taking the time to talk with us today. Welcome. Jim Rickards: Thank you Mike, it's great to be with you. Mike Gleason: You've just completed a new book called, The Big Drop: How to Grow Your Wealth During the Coming Collapse. I've been reading this over the past few days now, and it's simply terrific. I urge everyone to check it out. There's so much eye opening information in here. I want to start out by asking you about a chapter that I found particularly fascinating… the one titled, Today's Currency and Financial Wars. In that section you wrote about the recent financial war we've been waging against Iran and the potential backlash that it may cause with Saudi Arabia, and thus the stability of the petrodollar. What is America up to with all of this, because you outline the potential for a very scary end game for the U.S. in that situation? Jim Rickards: Yes, thanks Mike. That's a great question and thank you for mentioning “The Big Drop.” That's my new book now. It's only available through the newsletter, through Strategic Intelligence and Agora Financial, so it is available to interested parties but it's not for sale on Amazon or bookstores so there's a certain channel to get it, but it's out there. Again, thank you for mentioning it. What I do in The Big Drop among other things is update some of my previous work of financial warfare because we're in the middle of a financial war. We are in a financial war with Russia right now. We had been in a financial with Iran in 2011, 2012. I talked about that in my second book, The Death of Money. In December 2013, the President declared a kind of truce, if you will, or détente with Iran, so suddenly Iran is our friend. Russia is still our enemy. China, we're kind of watching warily but these are all ongoing financial wars in different stages. They're either active, in the case of Russia, potential in the case of China, or there's a little bit of a time-out in the case of Iran. But they all bear watching. Investors have a difficult enough time as it is today because of uncertainty about Fed policy. We're sort of I describe this as being on the knife's edge of inflation or deflation. People say, "Well, which is it going to be? If you have inflation I know exactly what to do. If we have deflation I know exactly what to do. So what is it?" The correct answer is it could tip either way with all the money printing and monetary use, and if there's a sudden loss of confidence inflation could come up very, very fast, very quickly in extreme ways as it did in the 1970's. But given technology, demographics, and debt deleveraging we could be in the grip of deflation, which we haven't seen really since the 1930's. So it's a very difficult world just because of those dynamics. When you throw financial warfare on top of it and just to make it a little more challenging some of the financial warfare is being fought out in cyberspace. In other words you can do a lot of harm in cyberspace and I think you know listeners understand that. One of the threats is you get into the operating software of a major dam somewhere and open the floodgates you can kill possibly hundreds of thousands of people by flooding downstream locations. That's a case of using cyber warfare to take command of what we call critical infrastructure and cause a lot of damage. Then we've talked about financial warfare. We'll talk a little bit more about that in a second but imagine combining the two. Combining financial warfare and cyber warfare where you would actually go into the operating system of a major stock exchange and start spoofing orders. Sell Apple, sell General Electric, sell all these major Dow stocks or leading stocks and cause the stock market to crash. If people think that's far-fetched or it's a fantasy, my answer is, "no it's not." In 2010, the FBI and Department of Homeland Security found a Russian attack virus inside the NASDAQ operating system. Now, this was not some criminal gang trying to get your credit card or account numbers. This was actually Russian military forces using, they actually have a success in persons cyber brigade, if you can believe that, kind of waging full time financial warfare. By the way, the U.S. does the same thing but part of the point I make is there's an asymmetry. Let's say Russia can shut down the New York Stock Exchange or the NASDAQ. Let's say America's equally capable so we can shut down the Moscow stock exchange. Well who wins? In other words, the Moscow stock exchange is irrelevant. It's just not an important stock exchange but of course we all know how important the NASDAQ and the New York Stock Exchange are. There's an example where even though our cyber warriors are equally capable, the Russians are very good and we're very good, the damage is asymmetric. We suffer more than they do so that's one of the trump cards they have. Then you sort of apply that in normal kinetic space, physical space, where you've got obviously what's going on in Ukraine with heavy artillery, and tanks, and armor. Warfare is no longer confined to the physical kinetic battlefield, hasn't been for a long time. I mean, we've seen the development of sea power, air power, space power, cyber power, and now we're seeing the development of financial warfare. So the state of play right now is that we're in a financial war with Russia. Our status with Iran is one of détente obviously related to the President's desire to get this nuclear agreement in place. Let's see if that happens or not. They just blew off one deadline my guess is they'll blow others. What the President really wants to do is just run out the clock until 2016 and dump this in the lap of whoever the next president is, be it democrat or republican. The White House today is just playing for time and of course nobody is better at playing for time than the Iranians. So none of this is going away quickly, but my only point to investors is you have enough to be concerned about with the depression we're in and the inflation-deflation tipping point and certainly bad Fed policy but here's one more thing. Good reason to have gold by the way because gold is not only a safe haven, gold holds up very well in dangerous times, I think listeners understand that, but another reason I like gold is because it's a non-digital asset. Physical gold, you can't hack it, you can't erase it, you can't get into the operating system and make it disappear. That's in addition to the normal safe haven demand. One more reason to have gold that I like is the fact that it's a physical asset, so it's not really susceptible to all this cyber warfare that's going on. Mike Gleason: Expanding a bit on and examining just how vulnerable the United States may be you participated in the first financial war game held by the Pentagon a few years ago. As you've described in your writings you've obviously got some real intimate knowledge of all of this, and the kinds of things that keep some of our government officials, and intelligence, and security personnel up at night. Expand on that experience and then also what do you think are the greatest risks we as Americans face when it comes to the current state of the global monetary system. Jim Rickards: Sure, that war game I described in chapters one and two of my first book, Currency Wars, so I'm happy to talk about it right now and kind of give the listeners a little color, but if they're really interested they could get Currency Wars. It's out in paperback and I give a much more detailed explanation. Just to give a little color, this was the first ever financial war game ever conducted by the Pentagon. Now of course they do war games all the time on various scenarios around the world and they should, it's good to think ahead and think about threats that it doesn't necessarily mean that something is going to happen but you need to be prepared in case it does. Back in late 2008, early 2009, the Pentagon said that they wanted to do a financial war game. I was invited to do two things. One help design the game. It had never been done before. We did this at a top secret weapons laboratory halfway between Washington and Baltimore. We had about a hundred participants when all was said and done, a very large war room type environment with almost something out of the movie, like the movie War Games or Dr. Strangelove, or Fail Safe, if you remember those old Cold War type movies but that kind of environment with large screens on the walls and a lot of computer software, and different sections broken up. We had the participants certainly from the uniformed military, civilian Pentagon leadership, the CIA, the FBI, Department of Treasury, representatives from the Fed, Department of Homeland Security, a lot of think tank people, professors, and some Wall Streeters like myself. So it was a very eclectic group of people. We did it over the course of two days. We had to design it because you say it's like writing the rules of any game. How long would it last, what would the teams be, what would the sequence of moves be, etc? Then allow that to play out in real time, which is what we did. Then I also got to play in the game, be a participant in the game. I was on the China team with a few colleagues. Then we did it over, as I say, a couple of days. The main thing that I did once the game actually started is, with the help of some colleagues who were on the Russian team, we cooked up a little plot in advance and didn't tell anybody. I said, "Let's make this as realistic as possible so we'll have some back channel plotting in addition to what goes on in the room." We came up with a plan whereby China and Russia would pool their gold reserves, put it in a vault in Switzerland, and create it back to London. When it was back in London, we'd issue a new currency backed by the gold in Switzerland. We had to use London and Switzerland because we knew no one would actually trust the Chinese and Russians in terms of keeping an eye on their gold. The kicker was that they announced that Russia henceforth, if you wanted Russian natural resource exports or Chinese manufactured goods, you could only pay for it in this new gold backed currency. And if you wanted some of the currency you could either earn it by trading with them and running a surplus and they would pay you in it, or you could put your own gold in the vault in Switzerland then the London bank would give you some currency. Then you could use it to trade with China and Russia. Now obviously this was an effort to run the dollar off the road and basically eliminate the dollars advantage as kind of hegemonic global currency, which it is today. Now, nobody thought this was going to happen the next day. This was not something that was going to happen right away, but we wanted to, as I say, give the Pentagon their money's worth and let them look into the future a little bit. Well, it was interesting. The reaction was partly one of ridicule. We certainly had Harvard professors and other very distinguished analysts kind of laugh at us, say, "What's wrong with you guys? Don't you know that gold is not part of the international monetary system? It's not a monetary asset. It never will be. Why are you wasting our time with this, etc.?" We said, "Hey, it's a war, anything can happen. Let's just play it out." We had some support in the room and finally we did play it out. It played out in very interesting ways in the course of a couple of days, and again this is all in the book, if listeners are interested in reading more about it. Here's the bottom line, we did this in 2009, we were pretty much laughed at even though we played it out. Since 2009 Russia has more than doubled its gold reserves. They've gone from about six hundred tons to about 1,200 tons and they're adding more all the time. China has increased its gold reserves by a factor of three or four. They've gone from about 1,000 tons to some number. No one knows the exact number because they don't disclose it, it's a state secret, but there's enough information from Chinese mining output, Hong Kong imports, Shanghai gold exchange transactions, and other sources. There's enough information to infer reasonably that China has four or five thousand tons, perhaps more. Every time I've updated my estimates of Chinese gold, to the extent that I've been wrong, I've always been wrong on the low side. I pick a number based on analysis and then I get that information and it turns out the number is actually higher. So it does seem that they're on their way to acquiring 8,000 tons; try to put themselves on a par with the United States. Having said all that, here we were kind of ridiculed in 2009 but since then Russia and China have behaved exactly, exactly the way we predicted they would, which is they are acquiring massive gold reserves. Who knows what their next move is, but it could take a lot of forms, and again, my view of the Chinese situation is simple, which is China is acquiring thousands of tons of gold. One of two things is true, either they're stupid or they know something that we don't. I have spent a lot of time in China. I have a lot of Chinese friends. They're not stupid. Therefore, my assumption is they know something we don't. If buying gold is good enough for the Chinese, it's good enough for me and I think that's reason enough for investors to own some. Mike Gleason: Talk about how you see things playing out here. I've read that you feel the most likely may be the launching of a global currency by the International Monetary Fund. What about that and what about gold possibly reasserting itself? Jim Rickards: It's a good question Mike but just to frame it a little bit I'm not talking about the launching of global currency. They already launched it. This, what we're talking about is the Special Drawing Right, which is just a fancy name for world money. They call it the SDR but SDR stands for Special Drawing Right. It is world money. They gave it a sort of geeky, technical name because they don't really want people to understand what it is. Another good example of that is our central bank. Look at what we call it. We call it the Federal Reserve System. Why don't we call it the Central Bank of the United States? Well the reason is that Americans hate central banks. We've had two central banks in the past, in the eighteenth and nineteenth centuries, and we abolished both of them. So when they started this new one in 1913 they didn't want to call it the Central Bank of the United States because they knew that people didn't like it. They gave it this technical name, Federal Reserve System, but of course it is a central bank. Well it’s the same thing with the IMF, if they launched a currency and called it world money, that would be kind of spooky and scary to a lot of people so they call it the Special Drawing Rights so nobody would know what it was but it is world money. That's exactly what it is but there's nothing new about it. It was created in 1969 so it's over forty years old going on forty five, fifty years old at this point. There are hundreds of billions of them outstanding. They were issued at various times in the early 70's up to 1980. Then there was along hiatus, the period of what I call King Dollar from about 1980 to 2009, almost thirty years, when they did to issue any. Then in 2009, in August 2009, they issued a very large amount of SDR's. No one noticed. I notice because this is kind of where I spend my time doing research and what I focus on but it didn't seem to attract a lot of attention at the time. Just so the listeners understand, this has been out there for almost fifty years. There are hundreds of billions of them already outstanding. They issued some during the crisis in 2009 and they will issue more when we get to another financial crisis. There's nothing new about any of this but it is new to a lot of listeners because they haven't heard about it, it's been kept under wraps. This world money, this Special Drawing Rights, it's not something that you and I are going to have in our pockets. This is not walking around money. There are not going to be paper versions of it that we take down to the grocery store. We'll still use U.S. dollars but the point is the U.S. dollar will be turned into a local currency. It will be like when I go to Turkey I buy some Turkish lira, when I go to Mexico I buy some Mexican pesos, and when people come to the United States they'll get some U.S. dollars, but it'll just be a local currency. The important things in the world, when I say important I'm talking about selling balance between countries, the price of oil, maybe the price of some other global commodities, the books and records of the major multilateral financing institutions, regional development banks, and perhaps the generally accepted accounting principle financial statements of major corporations like General Electric, or Siemens, or SAP, or Volkswagen, or Sony, etc, will all be recorded in SDR so it will be kind of a big boy currency or unit of account. We won't have it in our pockets but the impact of it will be to create inflation that no one knows where it's coming from. In other words you'll be able to bail out the world, re-liquefy the world, and create inflation by printing SDR's. You'll see the inflationary impact when you go to buy groceries or whatever but the Fed and the Treasury will say, "Hey it's not us, you know, it's those guys over at the IMF" but of course no one even knows where the IMF is, let alone where this inflation is coming from. It's not a secret plan. I like to say the IMF is transparently nontransparent. What I mean by that is they actually tell you what they're doing. You can go to their website. None of what I'm describing is inferential or invented. You can just go to the website and this is all there but no one understands it. It's like reading, if you're not a cell biologist you're not going to read a cell biology paper with much comprehension necessarily so if you're not an expert in international monetary system none of this going to make a lot of sense, although I try to explain it in plain English. So we're going to be hearing more about it. The big event this year, in 2015, will be that the price of an SDR is calculated by reference to a basket of currencies. Now there's a lot of confusion about that. People say, "Oh, it's backed by a basket of currencies." That's not true. It's not backed by anything. It's not backed by anything but the value is calculated by using a basket of currencies. The currencies currently are the U.S. dollar, the euro, the Japanese yen, the Swiss franc, and pound sterling. The issue would be do you include other currencies in the basket? It looks like later this year they're going to include the Chinese yuan, which will obviously be a big step forward in terms of China's plans to compete with the U.S. in terms of global financial dominance. Look for that later this year. You're going to be hearing a lot more about SDR's but the one thing I would say is this plan has been out there for almost fifty years. There's nothing new about it. You’ve just heard part one of an explosive two-part interview with Jim Rickards. 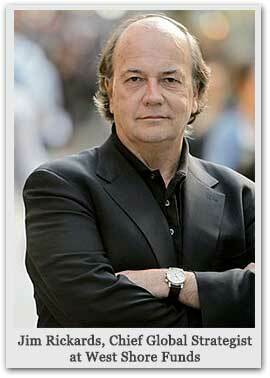 Don’t miss the must hear conclusion to my interview with Mr. Rickards, which we’ll have for you next week. But before we go I want to tell our listeners that we have lined up a way for you to get a copy of Jim’s new book, The Big Drop: How to Grow Your Wealth During the Coming Collapse. It's incredibly extensive and chopped full of fantastic information, but it’s only available online through a special offer. Click here to receive the book along with a risk free trial of Strategic Intelligence, Jim’s newsletter that you do not want to miss. I strongly encourage our MoneyMetals customers and all podcast listeners to jump on this opportunity right away. You won't be disappointed. Money Metals Exchange. Thanks for listening and have a great Easter weekend everybody.